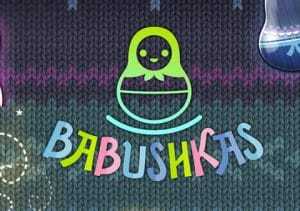 If you’re looking for a video slot that’s more than a little different from the norm, then you’ll want to take a look at Babushkas, a 5 reel, 17 payline, Russian-themed game from Thunderkick. Based on the famous Matryoshka dolls, the superbly designed game comes with single symbol and all symbol upgrades as well as a free spins feature. Play on desktop, tablet or mobile from between 10p and £100 per spin. Thunderkick has a reputation for creating some of the best looking slots around and Babushkas maintains those impeccable visual standards. The imagery here is superb – the reels feature seven different coloured Matryoshka dolls, each of which is given a numerical value. They’re supremely detailed and fantastically well drawn. Scare Bear feature – the lowest value symbols on the reels will be upgraded. This will happen 1, 2 or 3 times depending on the size of the bear. Charm Bear feature – all of the symbols on the reels are upgraded by 1 level. Dance Bear feature – here you’ll be awarded 7 free spins. A new wild egg symbol is added to reel 3 on each of these free spins. Babushkas also comes with a winning symbol upgrade feature which can transform symbols into higher value ones when this leads to new winning lines. If you manage to fill the screen with 15 of the same symbol following a series of upgrades, you’ll create a wipe and they’ll be upgraded 1 more time. If you manage this with the highest value symbol, you will receive a special prize of 100 times your stake. Potentially, there’s up to 390 times your stake to be won on every spin – of course you’re unlikely to win that amount too often but if you get on a roll with the symbol upgrades some bumper payouts are possible. As we’ve mentioned before, Thunderkick powered video slots are usually beautiful creations and Babushkas is no exception. The graphics are as good as you’ll find anywhere with the action playing out to a Russian-style backing track that has real ear worm potential. The gameplay is certainly a little different so a few spins in demo mode are recommended. Once you have got accustomed to the symbol upgrades and dancing bears, there’s a lot to like here. The variance may be a bit lower than we’d like (it’s in the low to medium range) but for innovation and quality design Babushkas is a Russian delight. I also recommend Esqueleto Explosivo from Thunderkick which is superb.